Cameron Green celebrates a touchdown last December. The superback said in a Tweet on Monday that he is retiring from football. 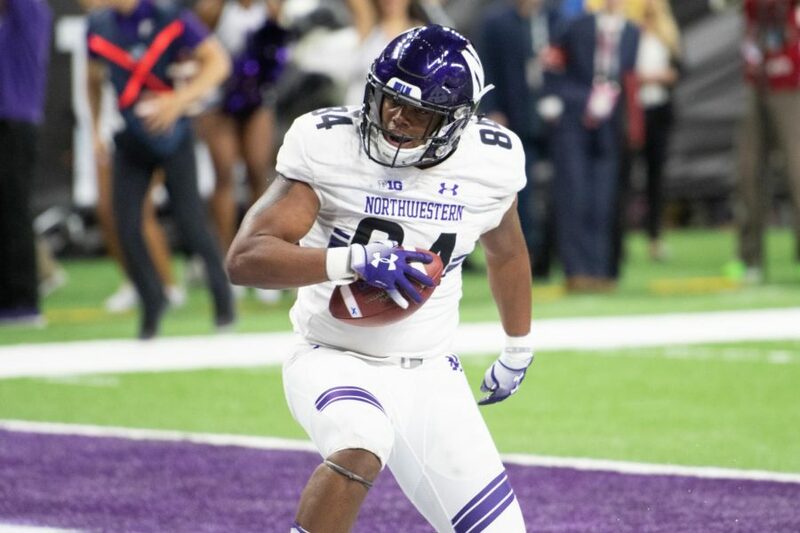 INDIANAPOLIS — There was no question coming out of halftime of Saturday’s Big Ten Championship Game: If Northwestern didn’t score right away, the game would get out of hand. So after a disappointing first half performance, coach Pat Fitzgerald and his offensive staff took longer than usual in their meeting. His chat worked. The No. 21 Wildcats came out firing and needed less than two minutes to find the end zone. Then less than six minutes later, they scored again to bring the game within three points. But NU (8-5, 8-1 Big Ten) couldn’t sustain it, and in the end No. 6 Ohio State’s high-octane offense was just too much for the Cats’ defense — missing multiple starters in the secondary — to handle in a 45-24 loss that was far closer than the final margin suggests. For that stretch, NU moved the ball at will against an Ohio State (12-1, 8-1) defense that frustrated the Cats for most of the night. Thorson found sophomore receiver Kyric McGowan twice to open the drive, then ran it in himself from 18 yards out. After a three-and-out, Thorson found four different wideouts on an 11-play drive capped off by a two yard toss to superback Cam Green, and NU was in business. Then Jordan Thompson forced a fumble that Travis Whillock recovered, and NU suddenly had a chance to take the lead. Even former NU running back Justin Jackson needed to weigh in. “OH MY GOD IM FREAKING OUT LETS GO,” he tweeted. But it wasn’t meant to be. NU went three and out, and the Buckeyes (12-1, 8-1) wasted no time countering and extending their lead to 10 before the quarter — the only one the Cats won — could even end. It looked like they might put the game away after driving into the red zone once again, but senior defensive tackle Fred Wyatt came up with a huge field goal block and the Cats had the momentum again. Yet NU settled for a field goal after a long drive and Dwayne Haskins finally blew the lid off the Cats’ secondary, strengthening both his Heisman hopes and Ohio State’s playoff hopes in the process of a 499-yard, five-touchdown performance. Even in the loss, the third quarter response is something the Cats can look to build off, both in this year’s bowl game and in the coming seasons. The Ohio State defensive front pressured Thorson all night, but for a few moments, the purple and white clad north section of the stadium actually drowned out the support for the scarlet and grey. After the game, a dejected Thorson talked about his team’s ability to respond to adversity.